Progress at No8 First Street continues to gain momentum and PATRIZIA UK has now unveiled a series of new images following a significant surge in occupier interest. 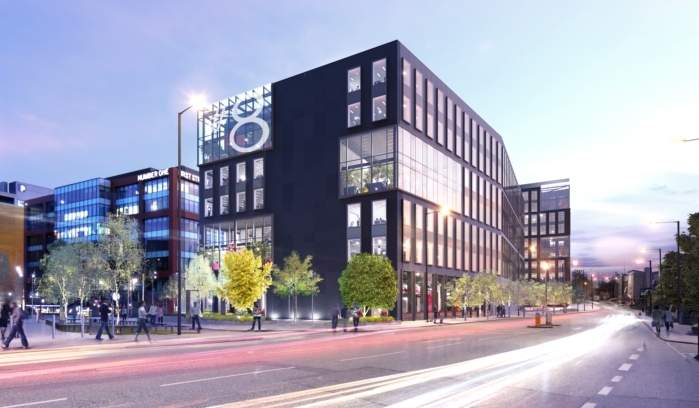 The 173,600 sq ft Grade A office building, which is being delivered by a joint venture between PATRIZIA UK and GMPVF, will feature unique, double-height winter gardens at each alternate corner which will be lit at night as well as large, column-free floor plates and a spacious reception area. Work on the building, which faces onto Tony Wilson Place, the new public square at First Street, has been progressing rapidly since the recent topping out ceremony and it continues to take shape this week with the installation of the exterior cladding. In addition, a series of new leisure outlets have opened across the First Street estate this month attracting further interest from occupiers, as well as new visitors during the busy day and evening trading periods. Operators that have recently opened include the award-winning The Liquor Store and The Gasworks Brewbar with Laundrette due to open on December 5th. A bespoke marketing suite for No 8 has opened this week and a series of occupier and agents tours will take place before Christmas. PATRIZIA has already secured the pre-let of c.50,000 sq ft of space to global energy company Gazprom and the remaining 106,000 sq ft of office space is available to occupiers looking to relocate to this vibrant leisure and business environment. Savills and GVA are instructed as joint agents on the building which is due for completion in September 2017.